Yes, very lightly (about 5-10 microns) – this is very important – if it didn’t scratch, it would aggressively blunt the blade. The scratches are so fine that no dirt or particles can get trapped in it. You cannot even stain it. As it is a renewable surface, a light sanding with fine sandpaper will smooth out the patina. You can repeat this as many time as you like over the years. Will it blunt my knives? No, the material is softer than the knife, which means it will give way to the blade, unlike glass or marble/granite which destroys knife blades very quickly. The Setta cutting boards are perfectly balanced in the trade off between strength, durability, hygiene and the maintenance of a blade edge. It is classes as “knife friendly” with no hygiene issues. Is it domestic / industrial dishwasher safe? Can I put hot pots / pans on it as a Trivet? Yes, within reason. The material is heat resistant to a temperature of 150°C/300°F, although it is adverse to localised thermal shock, meaning heat transfer from Hot to Cold too rapidly, or extreme heat over a small area of the board for a prolonged period. Setta Food Preparation Boards won first place at the prestigious “World Food Hospitality International Awards” expo for Best Product in the Food and Hospitality Industry in the World 2014 / 2015. Setta is the proud official sponsor of the SACA, the South Africa Chef’s Association. Shipping is not included. Please advise if you require courier/shipping. How good is a Setta Chopping Board really? Short answer, the best ! Setta was launched onto the market in September 2012 with the Domestic Range of cutting Settanite boards, in June of 2014 the Pro Chef Range was launched which quickly received world wide acclaim with our FHW International award. In that period to date Setta has sold over 16 000 units of its products. 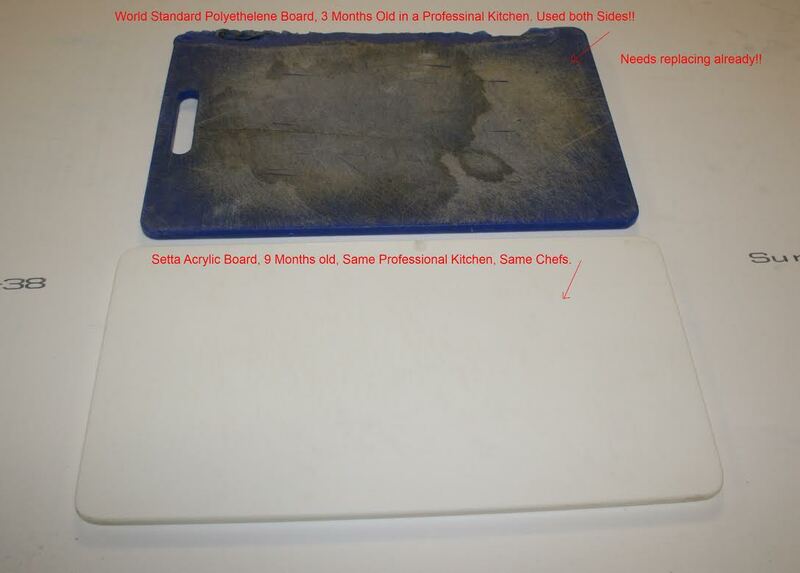 If you want to know how Hygienic Setta Boards are, one of the large processing companies we supply is LSG Sky / Air Chefs. The company that supplies almost every airline meal prepared for International Airline carriers. The levels of hygiene in these facilities are the highest in the world. LSG tested Setta boards rigorously under extreme conditions for 3 months. Trying everything to stain/damage them. They could not fault our product and now we supply them. If you want to know how durable they are, we supply Spur. Their kitchens are extremely demanding on any product , the old plastic Polyethelene (PA) boards had a life span of about a month. Then were replaced. Ours have been going for two and a half years now. Setta also sponsors some of the biggest International Chefs on the planet, who all use Setta Domestic, or the Pro Chef Range. These Chefs include : Buddy Valastro ( Cake Boss) , Reza Muhamad (Spice Prince ) , Chef Matt Preston (Masterchef Judge AU ) , Chef Emma Dean ( Masterchef Winner AU) , Chef Gennaro Contaldo ( Greedy Italians ) , Chef Lisa/Helen Tze (BBC Sweet Maidens) , Chef Matt Preston ( Masterchef AU) Chef John Torode ( Masterchef Judge UK ) Chef Adriano Zumbo ( Celebrity Chef Australia) and a host of South African Chefs that we sponsor under the banner of the South African Chefs Association (SACA) which Setta is the official sponsor for. Our SA spokesperson is none other than Chef Stephen Billingham (President SACA). See our Chef Demos in the Blog section. Every Setta Board is made out of the same material called Settanite. (R) . Weather you are a big shot celebrity chef or a novice home chef enjoying the love of cooking for yourself in the kitchen, you are all using the same thing. This to us is very important. Setta has only come this far with every one of you out there that has trusted us and has purchased our products. For that we thank you. Setta Global reach thus far.. Places Setta has shipped to. Difference between Polyethelene (PA) Plastic and Settanite. 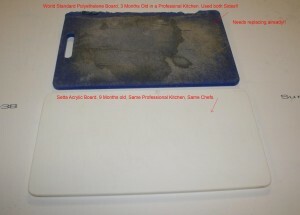 SETTANITE Boards: The Settanite boards are all dishwasher safe. Although this is not often necessary. A simple wash or scrub in warm water and soap will get the board clean and free of bacteria. BAMBOO Boards: All the Setta Bamboo Boards are sealed wit Caranuba Oil and natural Beeswax. This does not need to be repeated. A wash in warm water and soap is all that is needed. For a rejuvenating clean, a light oiling (olive oil works best) and a scrub with course salt and Lemon juice does the trick perfectly. If you are in JHB, oil a little more regularly due to the dry air in winter. Remember: Always wipe down or dry off with a clean cloth. No good having a spotless board and then wiping it down with a grubby cloth. Youre just adding bacteria to a clean surface.